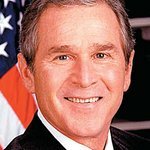 The George W. Bush Institute this week unveiled the Freedom Collection, a first-of-its-kind living repository documenting the continued struggle for human freedom and liberty around the world. 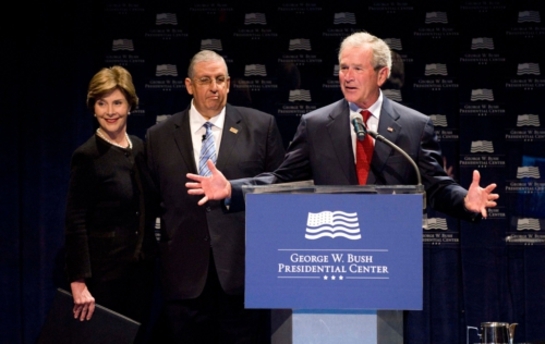 President Bush and Laura Bush spoke to an audience of dissidents, freedom advocates and representatives from local community organizations. Ellen Johnson Sirleaf, President of the Republic of Liberia and winner of the Nobel Peace Prize, joined them via video teleconference. The Freedom Collection, available online at www.freedomcollection.org, uses video interviews to document the personal stories of brave men and women who have led or participated in freedom movements from the 20th century to the present day. The Freedom Collection provides inspiration and insight to the current generation of freedom advocates. It helps to combat the feeling of isolation that can be common among dissidents by sharing the stories of those who have gone before in the fight to be free. The Freedom Collection currently contains the interviews of 56 dissidents including former Czech President Vaclav Havel, His Holiness the Dalai Lama, Her Excellency Ellen Johnson Sirleaf, and many other dissidents from countries like Burma, China, Iran, Syria, East Timor, Cuba and Egypt. New content will be uploaded to the site weekly. The Freedom Collection also includes a physical archive containing documents and artifacts from major freedom movements, including an early draft of the Tibetan Constitution given to President Bush by His Holiness the Dalai Lama. During Wednesday’s launch event, President Bush received a key artifact for safekeeping as part of the Freedom Collection – the Presidential Medal of Freedom he awarded to Dr. Oscar Elias Biscet in 2007 while Dr. Biscet was a political prisoner in Cuba. The Medal was presented to President Bush on behalf of Dr. Biscet by Dr. Angel E. Garrido, Vice President of the Lawton Foundation for Human Rights. Dr. Biscet remains in Cuba, where he continues the fight for freedom. The Freedom Collection will also educate and inform those in the U.S. and other free societies about the real challenges faced every day by those who live in authoritarian regimes. Many who view the Collection will find they share a common bond with the dissidents featured there as they hear the stories of ordinary people, like themselves, who have been capable of extraordinary sacrifice.